The user agent should allow the user to manually trigger elements that have an activation behavior, for instance using keyboard or voice input, or through mouse clicks. When the user triggers an element with a defined activation behavior in a manner other than clicking it, the default action of the interaction event must be to fire a click event at the element. The task in which the algorithm is running is currently processing an activation behavior whose click event's isTrusted attribute is true. The task in which the algorithm is running was queued by an algorithm that was triggered by user activation, and the chain of such algorithms started within a user-agent defined timeframe. For example, if a user clicked a button, it might be acceptable for a popup to result from that after 4 seconds, but it would likely not be acceptable for a popup to result from that after 4 hours. Each element has an associated click in progress flag, which is initially unset. If this element is a form control that is disabled, then return. If this element's click in progress flag is set, then return. Set this element's click in progress flag. Fire a synthetic mouse event named click at this element, with the not trusted flag set. Unset this element's click in progress flag. Let current object be subject. Loop: Append current object to output. If current object is an area element's shape, append that area element to output. Otherwise, if current object is a focusable area whose DOM anchor is an element that is not current object itself, append that DOM anchor element to output. If current object is a Document in a nested browsing context, let current object be its browsing context container, and return to the step labeled loop. The chain starts with subject and (if subject is or can be the currently focused area of a top-level browsing context) continues up the focus hierarchy up to the Document of the top-level browsing context. Each element can have a tabindex focus flag set, as defined below. This flag is a factor that contributes towards determining whether an element is a focusable area, as described in the previous section. 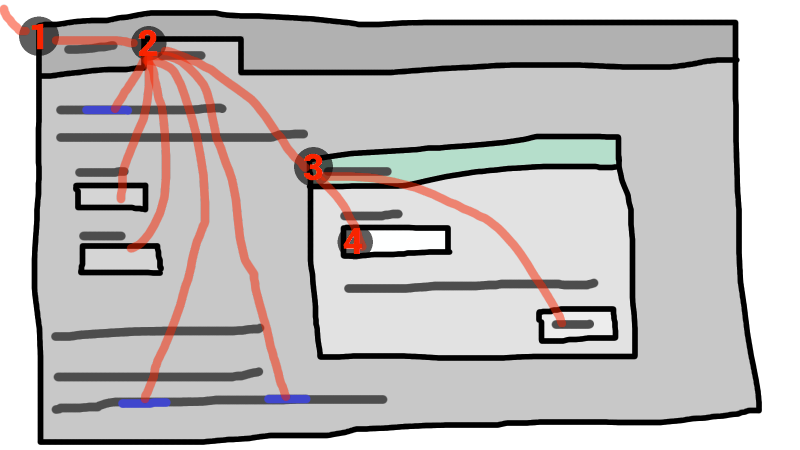 The user agent should follow platform conventions to determine if the element's tabindex focus flag is set and, if so, whether the element and any focusable areas that have the element as their DOM anchor can be reached using sequential focus navigation, and if so, what their relative position in the sequential focus navigation order is to be. The user agent must set the element's tabindex focus flag, but should omit the element from the sequential focus navigation order. One valid reason to ignore the requirement that sequential focus navigation not allow the author to lead to the element would be if the user's only mechanism for moving the focus is sequential focus navigation. For instance, a keyboard-only user would be unable to click on a text control with a negative tabindex, so that user's user agent would be well justified in allowing the user to tab to the control regardless. The user agent must set the element's tabindex focus flag, should allow the element and any focusable areas that have the element as their DOM anchor to be reached using sequential focus navigation, following platform conventions to determine the element's relative position in the sequential focus navigation order. before any focusable area whose DOM anchor is an element whose tabindex attribute has a value greater than the value of the tabindex attribute on candidate. An element with the tabindex attribute specified is interactive content. The focusing steps for an object new focus target that is either a focusable area, or an element that is not a focusable area, or a browsing context, are as follows. They can optionally be run with a fallback target. Let new focus target be the shape corresponding to the first img element in tree order that uses the image map to which the area element belongs. Let new focus target be the Document's viewport. Let new focus target be the browsing context's active document. Let new focus target be the browsing context container's nested browsing context's active document. If no fallback target was specified, abort the focusing steps. Otherwise, let new focus target be the fallback target. If new focus target is a browsing context container with non-null nested browsing context, then let new focus target be the nested browsing context's active document, and redo this step. If new focus target is a focusable area and its DOM anchor is inert, then return. If new focus target is the currently focused area of a top-level browsing context, then return. Let old chain be the focus chain of the currently focused area of the top-level browsing context in which new focus target finds itself. Let new chain be the focus chain of new focus target. Run the focus update steps with old chain, new chain, and new focus target respectively. User agents must immediately run the focusing steps for a focusable area or browsing context candidate whenever the user attempts to move the focus to candidate. If old focus target is inert, then return. If old focus target is an area element and one of its shapes is the currently focused area of a top-level browsing context, or, if old focus target is an element with one or more scrollable regions, and one of them is the currently focused area of a top-level browsing context, then let old focus target be that currently focused area of a top-level browsing context. Let old chain be the focus chain of the currently focused area of a top-level browsing context. If old focus target is not one of the entries in old chain, then return. If old focus target is a focusable area, then let new focus target be its Document's viewport. Otherwise, let new focus target be null. If new focus target is not null, then run the focusing steps for new focus target. When the currently focused area of a top-level browsing context is somehow unfocused without another element being explicitly focused in its stead, the user agent must immediately run the unfocusing steps for that object. The unfocusing steps do not always result in the focus changing, even when applied to the currently focused area of a top-level browsing context. For example, if the currently focused area of a top-level browsing context is a viewport, then it will usually keep its focus regardless until another focusable area is explicitly focused with the focusing steps. Focus fixup rule: When the designated focused area of the document is removed from that Document in some way (e.g. it stops being a focusable area, it is removed from the DOM, it becomes expressly inert, etc. ), designate the Document's viewport to be the new focused area of the document. For example, this might happen because an element is removed from its Document, or has a hidden attribute added. It might also happen to an input element when the element gets disabled. In a Document whose focused area is a button element, removing, disabling, or hiding that button would cause the page's new focused area to be the viewport of the Document. This would, in turn, be reflected through the activeElement API as the body element. If the last entry in old chain and the last entry in new chain are the same, pop the last entry from old chain and the last entry from new chain and redo this step. If entry is an input element, and the change event applies to the element, and the element does not have a defined activation behavior, and the user has changed the element's value or its list of selected files while the control was focused without committing that change (such that it is different to what it was when the control was first focused), then fire an event named change at the element, with the bubbles attribute initialized to true. If entry is an element, let blur event target be entry. If entry is a Document object, let blur event target be that Document object's relevant global object. Otherwise, let blur event target be null. If entry is the last entry in old chain, and entry is an Element, and the last entry in new chain is also an Element, then let related blur target be the last entry in new chain. Otherwise, let related blur target be null. If blur event target is not null, fire a focus event named blur at blur event target, with related blur target as the related target. In some cases, e.g. if entry is an area element's shape, a scrollable region, or a viewport, no event is fired. If entry is a focusable area: designate entry as the focused area of the document. If entry is an element, let focus event target be entry. If entry is a Document object, let focus event target be that Document object's relevant global object. Otherwise, let focus event target be null. If entry is the last entry in new chain, and entry is an Element, and the last entry in old chain is also an Element, then let related focus target be the last entry in old chain. Otherwise, let related focus target be null. If focus event target is not null, fire a focus event named focus at focus event target, with related focus target as the related target. To fire a focus event named e at an element t with a given related target r, fire an event named e at t, using FocusEvent, with the relatedTarget attribute initialized to r, the view attribute initialized to t's node document's relevant global object, and the composed flag set. Let target area be the currently focused area of the top-level browsing context. If target area is a focusable area, let target node be target area's DOM anchor. Otherwise, target area is a dialog; let target node be target area. If target node is a Document that has a body element, then let target node be the body element of that Document. Otherwise, if target node is a Document object that has a non-null document element, then let target node be that document element. It is possible for the currently focused area of a top-level browsing context to be inert, for example if a modal dialog is shown, and then that dialog element is made inert. It is likely to be the result of a logic error in the application, though. Let canHandle be the result of dispatching the key event at target node. If canHandle is true, then let target area handle the key event. This might include firing a click event at target node. If candidate is target, then return true. If the focused area of candidate is a browsing context container with a non-null nested browsing context, then set candidate to the active document of that browsing context container's nested browsing context. Each Document has a sequential focus navigation order, which orders some or all of the focusable areas in the Document relative to each other. The order in the sequential focus navigation order does not have to be related to the tree order in the Document itself. If a focusable area is omitted from the sequential focus navigation order of its Document, then it is unreachable via sequential focus navigation. There can also be a sequential focus navigation starting point. It is initially unset. The user agent may set it when the user indicates that it should be moved. For example, the user agent could set it to the position of the user's click if the user clicks on the document contents. Let starting point be the currently focused area of a top-level browsing context, if the user requested to move focus sequentially from there, or else the top-level browsing context itself, if the user instead requested to move focus from outside the top-level browsing context. If there is a sequential focus navigation starting point defined and it is inside starting point, then let starting point be the sequential focus navigation starting point instead. Let direction be forward if the user requested the next control, and backward if the user requested the previous control. Typically, pressing tab requests the next control, and pressing shift+tab requests the previous control. Loop: Let selection mechanism be sequential if the starting point is a browsing context or if starting point is in its Document's sequential focus navigation order. Otherwise, starting point is not in its Document's sequential focus navigation order; let selection mechanism be DOM. Let candidate be the result of running the sequential navigation search algorithm with starting point, direction, and selection mechanism as the arguments. If candidate is not null, then run the focusing steps for candidate and return. Otherwise, unset the sequential focus navigation starting point. If starting point is the top-level browsing context, or a focusable area in the top-level browsing context, the user agent should transfer focus to its own controls appropriately (if any), honouring direction, and then return. For example, if direction is backward, then the last focusable control before the browser's rendering area would be the control to focus. If the user agent has no focusable controls — a kiosk-mode browser, for instance — then the user agent may instead restart these steps with the starting point being the top-level browsing context itself. Otherwise, starting point is a focusable area in a nested browsing context. Let starting point be that nested browsing context's browsing context container, and return to the step labeled loop. The sequential navigation search algorithm consists of the following steps. This algorithm takes three arguments: starting point, direction, and selection mechanism. Pick the appropriate cell from the following table, and follow the instructions in that cell. The appropriate cell is the one that is from the column whose header describes direction and from the first row whose header describes starting point and selection mechanism. A suitable sequentially focusable area is a focusable area whose DOM anchor is not inert and that is in its Document's sequential focus navigation order. The home document is the Document to which starting point belongs. The home sequential focus navigation order is the sequential focus navigation order to which starting point belongs. The home sequential focus navigation order is the home document's sequential focus navigation order, but is only used when the starting point is in that sequential focus navigation order (when it's not, selection mechanism will be DOM). If candidate is a browsing context container with a non-null nested browsing context, then let new candidate be the result of running the sequential navigation search algorithm with candidate's nested browsing context as the first argument, direction as the second, and sequential as the third. If new candidate is null, then let starting point be candidate, and return to the top of this algorithm. Otherwise, let candidate be new candidate. デフォルトでは、このメソッドはまた要素をビューにスクロールする。Providing the preventScroll option and setting it to true prevents this behavior. Let candidate be the DOM anchor of the focused area of this Document object. If candidate is not a Document object, then return candidate. If candidate has a body element, then return that body element. If candidate's document element is non-null, then return that document element. The hasFocus() method on the Document object, when invoked, must return the result of running the has focus steps with the Document object as the argument. Let current be this Window object's browsing context. If current is null, then return. Run the focusing steps with current. If current is a top-level browsing context, user agents are encouraged to trigger some sort of notification to indicate to the user that the page is attempting to gain focus. The blur() method, when invoked, provides a hint to the user agent that the script believes the user probably is not currently interested in the contents of this Window object's browsing context, if non-null, but that the contents might become interesting again in the future. Historically, the focus() and blur() methods actually affected the system-level focus of the system widget (e.g., tab or window) that contained the browsing context, but hostile sites widely abuse this behavior to the user's detriment. If the element is marked as locked for focus, then return. If the value of the preventScroll dictionary member of options is false, then scroll the element into view with scroll behavior "auto", block flow direction position set to a UA-defined value, and inline base direction position set to a UA-defined value. The blur() method, when invoked, should run the unfocusing steps for the element on which the method was called. User agents may selectively or uniformly ignore calls to this method for usability reasons. Otherwise, split the attribute's value on ASCII whitespace, and let keys be the resulting tokens. If the value is not a string exactly one code point in length, then skip the remainder of these steps for this value. If the user agent can find a mix of zero or more modifier keys that, combined with the key that corresponds to the value given in the attribute, can be used as the access key, then the user agent may assign that combination of keys as the element's assigned access key and return. Fallback: Optionally, the user agent may assign a key combination of its choosing as the element's assigned access key and then return. When the user presses the key combination corresponding to the assigned access key for an element, if the element defines a command, the command's Hidden State facet is false (visible), the command's Disabled State facet is also false (enabled), the element is in a document that has a non-null browsing context, and neither the element nor any of its ancestors has a hidden attribute specified, then the user agent must trigger the Action of the command. The contentEditable IDL attribute, on getting, must return the string "true" if the content attribute is set to the true state, "false" if the content attribute is set to the false state, and "inherit" otherwise. On setting, if the new value is an ASCII case-insensitive match for the string "inherit" then the content attribute must be removed, if the new value is an ASCII case-insensitive match for the string "true" then the content attribute must be set to the string "true", if the new value is an ASCII case-insensitive match for the string "false" then the content attribute must be set to the string "false", and otherwise the attribute setter must throw a "SyntaxError" DOMException. When the designMode changes from being disabled to being enabled, the user agent must immediately reset the document's active range's start and end boundary points to be at the start of the Document and then run the focusing steps for the document element of the Document, if non-null. The element will be checked for spelling and grammar if its contents are editable and spellchecking is not explicitly disabled through the spellcheck attribute. The element will never be checked for spelling and grammar unless spellchecking is explicitly enabled through the spellcheck attribute. If the autocapitalize content attribute is present on element, and its value is not the empty string, return the state of the attribute. If element is an autocapitalize-inheriting element and has a non-null form owner, return the own autocapitalization hint of element's form owner. The autocapitalize IDL attribute, on getting, must return the string value corresponding to own autocapitalization hint of the element, with the exception that the default state maps to the empty string. On setting, it must set the autocapitalize content attribute to the given new value. User agents that support customizable autocapitalization behavior for a text input method and wish to allow web developers to control this functionality should, during text input into an element, compute the used autocapitalization hint for the element. This will be an autocapitalization hint that describes the recommended autocapitalization behavior for text input into the element. User agents or input methods may choose to ignore or override the used autocapitalization hint in certain circumstances. If element is an input element whose type attribute is in one of the URL, E-mail, or Password states, then return default. If element is an input element or a textarea element, then return element's own autocapitalization hint. If element is an editing host or an editable element, then return the own autocapitalization hint of the editing host of element. Assert: this step is never reached, since text input only occurs in elements that meet one of the above criteria. The inputMode IDL attribute must reflect the inputmode content attribute, limited to only known values. When inputmode is unspecified (or is in a state not supported by the user agent), the user agent should determine the default virtual keyboard to be shown. Contextual information such as the input type or pattern attributes should be used to determine which type of virtual keyboard should be presented to the user. The enterKeyHint IDL attribute must reflect the enterkeyhint content attribute, limited to only known values. When enterkeyhint is unspecified (or is in a state not supported by the user agent), the user agent should determine the default action label (or icon) to present. Contextual information such as the inputmode, type, or pattern attributes should be used to determine which action label (or icon) to present on the virtual keyboard.